Years ago (more than I will admit to), my high school shop teacher said something that has stuck with me since that time… “The right tool for the right task. That valuable lesson not only applies to tools but materials too. For our use it will apply to our discussion of Balsa wood in this article. First, let me state that I have not, and will not ever claim to be an expert on the subject. However, I have acquired a fair amount of knowledge about this mysterious material we all use. In this article I will share the knowledge and tips that have been passed on to me. And in return, please pass this on to others in the future if it helps you. So let’s get started! 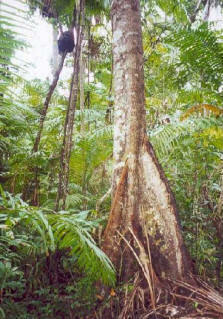 Balsa trees grow naturally in the humid rain forests of Central and South America and New Guinea. However, the small country of Ecuador, on the western coast of South America, is the primary source of model aircraft grade balsa in the world. Balsa needs a warm climate with plenty of rainfall and good drainage. For that reason, the best stands of balsa usually appear on the high ground between tropical rivers. There is no such thing as forests of balsa trees. They grow singly or in very small, widely scattered groups in the jungle. For hundreds of years, balsa was actually considered a weed tree. They reproduce by growing hundreds of long seed pods, which eventually open up and, with the help of the wind, scatter thousands of new seeds over a large area of the jungle. The seeds eventually fall to the ground and are covered by the litter of the jungle. There they lay and accumulate until one day there is an opening in the jungle canopy large enough for the sun's rays to strike the jungle floor and start the seeds growing. Balsa trees grow very fast. In 6 to 10 years, the tree is ready for cutting, having reached a height up to 90 feet tall and a diameter up to 45 inches. If left to continue growing, the new wood being grown on the outside layers becomes very hard and the tree begins to rot in the centre. Not harvested, a balsa tree may grow to a diameter of 6 feet or more, but very little usable timber can be obtained from a tree of this size. The start of the balsa business was during World War I, when the allies were in need of a plentiful substitute for cork. The only draw back to using balsa was, and still is, the back breaking work that is necessary to get it out of the jungle. Because of the way the individual balsa trees are scattered throughout the jungles, it has never been possible to use mass production logging procedures and equipment. The best way to log balsa trees is to go back to the methods of Paul Bunyan - chop them down with an axe, haul them to the nearest river by ox team, tie them together into rafts, and then float the raft of balsa logs down the river to the saw mill. At the saw mill, the balsa is first rough cut into large boards, and then carefully kiln dried, and finally packed into bales for shipment. As a result of the balsa tree's fast growth cycle, both the quality and lightness of the timber obtained from a balsa tree can vary enormously depending upon the tree's age at the time of cutting. The secret to balsa wood's lightness can only be seen with a microscope. The cells are big and very thinned walled, so that the ratio of solid matter to open space is as small as possible. To give a balsa tree the strength it needs to stand in the jungle, nature pumps each cell in the wood full of water until they become rigid - like a car tire full of air. Green balsa wood must therefore be carefully kiln dried to remove most of the water before it can be sold. Most people are surprised to learn that compared to other woods, balsa is only about the third or fourth lightest wood in the world. It is not until balsa is reached in that line that there is any sign of real strength combined with lightness. In fact, balsa wood is often considered the strongest wood for its weight in the world. Pound for pound it is stronger in some respects than pine, hickory, or even oak. There area two properties of commercial Balsa we will discuss in this article, Density and Cuts. Understanding these two properties will help you to select and utilize this materials light weight while maintaining strength in your model. First we will discuss density and then the different cut that are available. Finished balsa wood varies widely in density (or weight). Balsa is occasionally found weighing as little as 4 lbs. per cu. ft. On the other hand, you can also find balsa which will weigh as much as 24 lbs. or more per cu. ft. However, the average weight of commercial balsa will weigh between 6 lbs. to 18 lbs. per cu. ft. Eight to twelve lb. balsa is considered medium or average weight, and is the most plentiful. Six pounds or less is considered "contest grade", which is very rare and difficult to obtain (which in turn means more $$$). The different “grades” of the wood. I have also included a table that describes some common uses for the different “Grades” of balsa. This is not a “hard and fast” list of do’s and don’t but general guidelines to get you thinking about where to use what grade of balsa. A good basic rule to remember is the lighter the wood is in color the softer the wood is. Dark colored balsa can be quite hard. When purchasing Balsa select the LIGHTEST grades you can find, with the possible exception of that chosen for your wing leading edge and fin post. Balsa grades vary immensely, and it is a common misconception that a harder grade of sheet will be more crash resistant; this is not the case, because they tend to split and shatter on impact, whereas softer balsa flexes more, absorbing the energy without breaking. Sheeting covering (fuselages and wings). All wing and tail-plane ribs and tip blocks. Large section leading and trailing edges. Spacers on built up box fuselages. Wing spars of large cross-section. Auxiliary wing spars (multi spar wings). Fuselage longerons for open frame models. Small section leading and trailing edges. Fuselage longerons, 2.5mm sq and under. Auxiliary wing spars of very small X-section. In selecting balsa sheets for use in your model, it is important to consider the way the grain runs through the sheet as well as the weight of the sheet as we discussed above. The grain direction actually controls the rigidity or flexibility of a balsa sheet more than the density does. The following chart illustrates the 3 basic grain types for sheet balsa and lists the most appropriate uses for each. 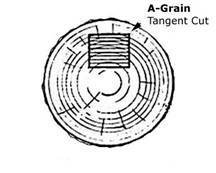 A-Grain sheet balsa has long fibers that show up as long grain lines. It is very flexible across the sheet and bends around curves easily. Also warps easily. Sometimes called "tangent cut". This cut should be used for sheet covering rounded fuselages and wing leading edges, planking fuselages, forming tubes, strong flexible spars. 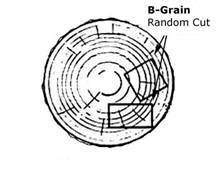 B-Grain sheet balsa has some of the qualities of both type A and type C. Grain lines are shorter than type A, and it feels stiffer across the sheet. It is a general purpose sheet and can be used for many jobs. Sometimes called "random cut". Use for flat fuselage sides, trailing edges, wing ribs, formers, planking gradual curves, wing leading edge sheeting. C-Grain sheet balsa has a beautiful mottled appearance. It is very stiff across the sheet and splits easily. But when used properly, it helps to build the lightest strongest models. Most warp resistant type. 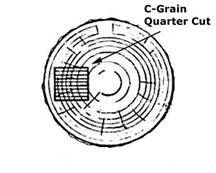 Sometimes called "quarter grain".